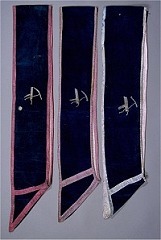 The sash was the most significant item of uniform adopted by friendly societies. Its use spilled over into the temperance movement and even the trades unions. It was worn with pride on public and ceremonial occasions to celebrate unity, demonstrate affiliation and indicate position and status. The images below are just some of the sashes that survive in collections across the Lothians and Fife, representing just a few of the hundreds of organisations and thousands of individuals that invested in these articles. At first sashes were homemade but by the end of the 19th century big suppliers dominated the market. They could be purchased by mail order or at Masonic Warehouses in any city. In some societies members were obliged to buy their own sash. However, others purchased ones to be used by officers that were passed on every year to the new incumbent.